Deleting an employee removes them from your account completely and is not reversible. If you want to add them back at a future date, a new profile will need to be created and they will have to go through the invitation process again. To delete an employee from the account, go to Dashboard > Employees. Click the options button (3 dots) next to the employee’s name in the list and select Delete employee. You’ll be asked what to do with any shifts or tasks assigned to that employee to complete the action. 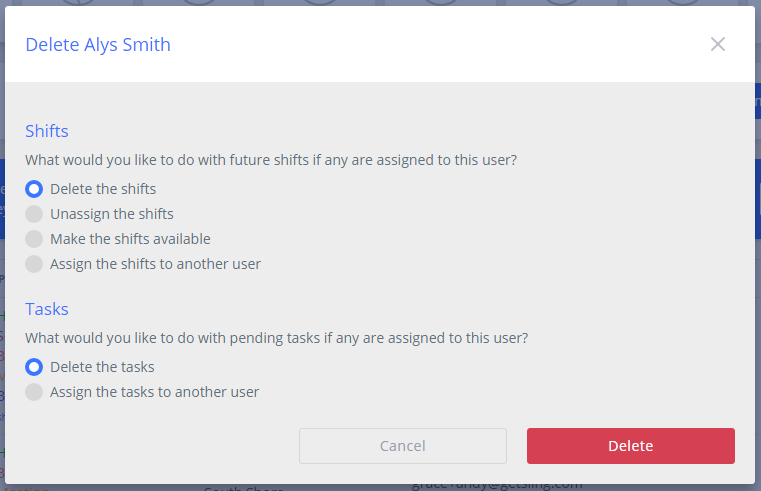 It is recommended that you delete any assigned shifts and tasks. Click Delete and the employee will be permanently removed from the account.